The facts around Alzheimer’s disease are overwhelming, but it’s easy to get involved. 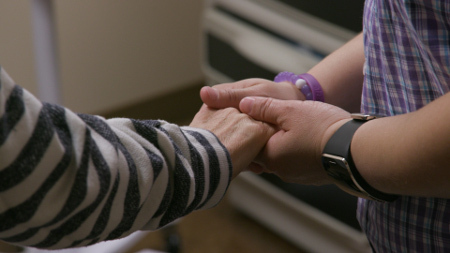 Whether you are dealing with a diagnosis personally, caring for a person living with the Alzheimer's, or simply want to raise awareness around the disease, the film, its supporting materials, and partner resources will help get you started. Educate yourself and others to stand up against Alzheimer’s disease. Take the first step; learn more about Alzheimer's disease by watching clips from Alzheimer’s: Every Minute Counts. Documentaries are a powerful conversation starter. Alzheimer’s: Every Minute Counts weaves together the sobering statistics about Alzheimer’s; expert commentary describing the societal consequences if we don’t have a medical breakthrough; and compelling stories filmed around the country in places where Alzheimer’s is growing rapidly – places where we see previews of the future happening today. Stream the full film and its clips for free online, or purchase the documentary, and download our Engagement Guide to find tips and discussion questions to get started. In a dementia friendly community, everyone plays a role and works together to create a dementia friendly culture. Take the first step by viewing a video about living with dementia and then further educate yourself by watching additional short sector-specific training videos about effective interaction and support of people living with dementia. Upon viewing the videos, individuals can register and commit to ways they will support people living with dementia (e.g. helping a neighbor, volunteering, adopting dementia friendly practices in their profession, or starting a dementia friendly community). Man the registration table or lace up your sneakers and get walking! June is Alzheimer’s & Brain Awareness Month, September is World Alzheimer’s Month, and November is both National Alzheimer’s Disease Awareness Month and National Family Caregivers Month. Every fall, the Alzheimer Association conducts its annual Walk to End Alzheimer’s in communities across the country. These events provide a variety of opportunities to volunteer and support efforts to address the Alzheimer's crisis. Clinical trials are underway across the country studying Alzheimer’s disease and are in need of both healthy individuals and those with an Alzheimer’s diagnosis. Volunteering to be part of a clinical research trial is an important way to help advance Alzheimer’s research. The Alzheimer's Association TrialMatch is a free, easy-to-use clinical studies matching service that connects individuals with Alzheimer's, caregivers, healthy volunteers and physicians with current studies, visit alz.org/trialmatch. While there is currently no way to prevent Alzheimer’s disease, preliminary research indicates that there are steps that can be taken to encourage healthy brain aging. Refer to the Alzheimer’s Association 10 Ways to Love Your Brain initiative or our tip sheet for lifestyle suggestions to get you started!